Physical Appearance : A fine creamish white powder based on special compounds having 96% active contents. 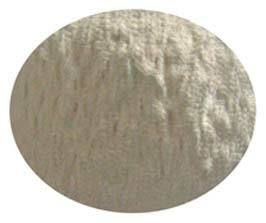 Poptan BFR is an alkaline powder with very fine particle size. It is uniformly but sparingly soluble in acid solutions. So it is an extraordinarily excellent self basifying agent for chrome tannages as its addition to chrome tan bath increases the pH very gradually which can be controlled by the amount added. So it offers a completely safe method for controlling the basicity of chrome tannage thus totally avoiding regular and close supervision required in case of other common alkalis used for basification. It is added soon after the penetration of chrome. An addition of 0.3-0.5% Poptan BFR on pelt weight is sufficient for normal pickle-chrome tan process although minor adjustments in pickie acid and amount of Poptan BFR for correct balance may be required. However, once this is obtained the process can be allowed to proceed safely with very little control for 6 hours to get the required pH level and boil test. Poptan BFR regulates a gradual increase in pH without initial rapid increase normally observed with sodium carbonate or sodium bicarbonate etc., leading to perfect and levelled chrome distribution throughout the cross section of collagen and a smooth and light coloured grain. Its fine particle size totally eliminates the risk of abrasion to the pelt and ensures best results. Poptan BFR reacts with sulphuric acid to give only soluble salts. Alkalis based on calcium when used lead to formation of insoluble calcium sulphate in the pelt, which has a detrimental effect on the dyeing and can result in white stains on dyed leather. Can be stored under normal conditions and has an indefinite shelf life. Some cake formation may occur if it is stored in warm and humid conditions, but this does not affect its chemical activity.